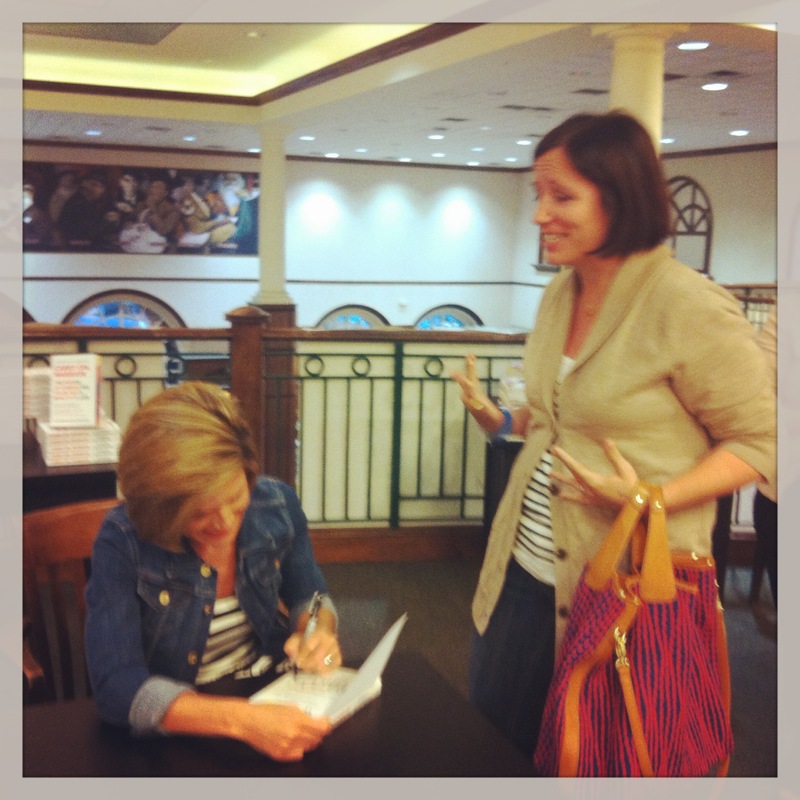 Glennon Melton Doyle recently swung through the DFW area while on her Carry On Warrior book tour. I know she may not be a household name for you as she is for me, but I thought I would pass along her words from that night. I’m sure you would also love to know that when meeting authors for the first time, my tendency is to say foolish things. Like when Glennon gave me a hug, I may or may not have said, “It’s so great to hug you in person. Because I hugged your book after I read it.” **Cringe** What you really want to know is not how I continue to embarrass myself during these type of events, but rather the 3 most common topics she hears from readers. Mom Guilt – How to Deal. There are two types of mom guilt. The first is “I feel guilty because I don’t always want to be engaged with my kids.” Glennon notes that this type of guilt is new to our generation. It looks like this. Our child is playing on their own. We are sweeping, cooking, sitting, reading, doing laundry, going to the bathroom, on our computer, talking on the phone, etc. In generations past, it might have been considered parallel play, but today it is a source of profound guilt and shame. It also looks like this. Our child wants to play My Little Pony, Barbie, Spiderman, Superman or whatever form of torture smartly packaged to look like a toy. We feel guilty because we don’t want to play. And instead of telling your precious child, “I will play with you for 10 minutes, but then I’m going to do (fill in the blank).” We feel guilty, beat ourselves up, question our parenting skills, and on and on. It is ok to not constantly engage your child. Constantly being the operative word. The second kind of guilt revolves around our kid suffering because (fill in the blank). Our job as parents is to protect our kiddos, right? Our job as parents is also to help our kiddos become brave, kind, strong and healthy. But sometimes when our kids are in pain, we think we’ve done something wrong. We try to fix it because to make the guilt go away. Often the struggle through pain and suffering is the only thing that will produce those brave, kind, strong, healthy kiddos. We might need to loosen our grips and our attraction to guilt. No one said it would be easy, right? Balance – How Do You Find It? Everything and everyone is coming at you. Work, home, friends, family, kids and many other things are pushing and pulling for your attention, but how do you find balance? Glennon shared a lesson on balance imparted by her yoga instructor. The concept of balance in yoga is opposing forces creating necessary tension to keep you upright or balanced. In other words, all those things pushing on us could actually help keep us upright. BUT…and this is a big but…in order to do this, we must participate fully in the rhythm’s of life – work/rest, give/take, help/ask for help. All too often our problem is participating fully in only side of the rhythm – we give, work, help, etc. We rarely take up the full rhythm to include rest, take and asking for help. That is why our balance is out of whack. I want to (blank) but (blank). Examples – I want to write, but I’m not that good. I want to dance, but I’m too old. I want to help out but I’m just not sure I’m needed. Glennon encouraged everyone to follow their dream and serve. She also noted that we have made up a third objective – get perfect first. Perfection is the but in the above sentence. Anyone that is doing anything awesome started doing it before they were ready. Whatever your dream or I want to (blank), do it. Don’t wait until you are ready or perfect. One last worthwhile discussion – what do you do if you are an extra thinky/feely type of person? Glennon’s suggestion is to seek out the arts. She noted that art is a world we make up that works. The world of art can help to reveal and explain as opposed to feeling the need to hide. Truth. Should I run into any more famous authors, I will be sure to pass along my awesome social skills as well as any worthwhile wisdom they imparted. This entry was posted in Just because, Life, Life Lesson, My Favorite Things and tagged Barnes and Noble Dallas, Carry On Warrior, Momastery. Bookmark the permalink.